Business insurance is a fact of life for most companies. While it may not be an exciting part of owning a small business, it is necessary to protect your assets. Without the right type of insurance and enough coverage to meet your company’s needs, you may be at risk of losing everything. The question then becomes what kind of business insurance you need to protect your assets. Beyond the most popular and commonly known types, such as general liability insurance, workers’ compensation insurance, and property insurance, there are several other types of insurance policies designed to address a broad range of potential losses. While you may not be familiar with these types of insurance, they may be critical to your business’ continued success. Any company that works on overseas projects through a contract with the federal government will be required to have DBA insurance. This type of insurance is governed by the Defense Base Act (DBA), and functions like workers’ compensation for any personnel staffed working internationally on a government contract. If a company does not obtain this type of insurance, it could face severe penalties, including fines, incarceration, loss of the government contract, and civil claims for any injuries or death. DBA insurance is the only recourse for employees who suffer work-related injuries or death while working overseas under government prime contracts and subcontracts. The coverage is broader than standard workers’ compensation insurance because it does not only cover employees during the workday; disability, medical and death benefits are provided to employees injured and killed during employment, whether or not the incident occurred during work hours. This type of insurance is offered only by government-approved insurers, with three companies dominating the market. Currently, approximately 200,000 employees are covered by DBA insurance. A companion law, the War Hazard Compensation Act (WHCA), compensates employees covered under the DBA for any injury or death that arises from a war risk hazard. This program, along with the DBA, is administered by the United States Department of Labor. An employer may be able to obtain a waiver for DBA insurance, but only if specific criteria are met and the United States Secretary of Labor signs the waiver. For any company engaged in government contracting work overseas, DBA insurance is not just recommended — it’s required. Failure to obtain this insurance can result in serious sanctions, including a loss of the contract. If your business has a government contract, an insurance broker can work with you to determine whether DBA insurance is necessary and to find the best possible coverage and rates for your DBA insurance. While Errors and Omissions (E&O) insurance may be a well-known type of insurance, what many business owners do not know is that if they provide any service or advice, they will likely benefit from this kind of insurance. E&O insurance is sometimes called Professional Liability insurance, which leads to the misconception that it is for professionals, like doctors, lawyers, architects, or accountants. In reality, any company that provides advice or a service can utilize this type of insurance. It provides coverage for any error or omission in the advice or service given by a company that leads to a lawsuit or claim for financial damages. In most cases, E&O insurance will pay for legal fees and any settlement or award for the loss suffered by a third party. It typically will not cover criminal or intentional conduct, such as fraud. This type of insurance can provide coverage for a wide range of companies and industries. This could include real estate agents, hairdressers, insurance agents, technology service providers, contractors and many other types of businesses. It may cover claims of misrepresentation, giving incorrect advice, or violating the principle of good faith. Coverage will depend on the specific policy terms, but as a general rule, E&O insurance will not cover intentional acts, illegal actions, and bodily injury or property damage. It is usually limited to only financial losses. For example, if a hairdresser uses a harsh chemical that severely damages a client’s hair and causes burns on her scalp, E&O insurance would cover the financial losses associated with the claim — such as if the client loses business because of her inability to appear in public — but it would probably not provide coverage for the injuries to her scalp. Those damages would likely be covered under a separate general liability policy. E&O policies vary widely in coverage and exclusions, so it is smart to check with an insurance broker to determine what your business’ needs are and what policy would offer the best coverage for your company. A broker can provide a range of options that will fit both your budget and your needs. Car insurance is something that most adults are familiar with, as it is a basic requirement for driving in the United States. But commercial automobile insurance is a distinct type of car insurance, designed specifically to provide coverage for vehicles used for work purposes. Many small business owners, and particularly self-employed individuals, may be surprised to know that their personal car insurance will not cover accidents if their car is deemed a work vehicle. The distinction between a work and personal vehicle depends on the specific facts of the situation. In some cases, it’s obvious, such as when the car is owned or leased by the company. But even if a vehicle is not owned or leased by a business, it may be classified as a “work vehicle” if it is used for business purposes. This may include picking up or delivering goods or using the vehicle for taxi services (such as driving for Uber or Lyft). If a car or truck is outfitted with specialized equipment used for the company — such as a plow, ladder racks or permanent toolbox — it may be considered to be a business vehicle. This classification is important, because if the automobile is involved in an accident, noncommercial car insurance may not cover the claim, even if the vehicle is also used for personal purposes. For example, if a handyman has toolboxes installed in his truck, his personal insurance may not cover claims for any accidents involving the truck. This may be true even if the accident occurs when the handyman is running a personal errand. The insurance company may decide that because the truck has been specially outfitted for business purposes, it is a work truck and therefore excluded from coverage under a personal car insurance policy. For this reason, anyone who uses their vehicle for business purposes should consider purchasing commercial automobile insurance. If you use a vehicle for business purposes, you may benefit from a commercial automobile insurance policy. A broker can analyze how you use your vehicle as well as your personal insurance policy to determine whether a commercial automobile insurance is necessary. He or she can also provide quotes for coverage, and help you understand the limits and exclusions of both a personal and a commercial automobile insurance policy. For any business that has any type of online presence, cyber liability insurance may be a necessary addition to your insurance portfolio. If a business collects credit card information or even personal information such as names or addresses, it could be sued if a hack or data breach results in a loss to their customers. Beyond breaches, an attack can cause a significant disruption in business and cause major financial losses. Cyber liability insurance can protect your company against these hazards. While cyber liability insurance may seem geared towards technology companies, almost every business can benefit from this coverage. Most companies have some internet presence and use computers in their daily work. This opens them up to potential claims based on privacy infringement, data breaches, and more. Cyber liability insurance is unique in that it usually provides coverage for both the business and third parties. This means that if your business suffers a hack, the insurance will likely pay your costs in responding to the incident, as well as the losses incurred by your customers. It may also provide coverage for the interruption of your business and lost profits. Working with a broker is a great way to determine whether cyber liability insurance is right for your business. A broker can analyze your company’s needs and help you decide what type and level of coverage will best protect your assets. A comprehensive insurance plan can be pricey, particularly for commercial policies with high limits. For this reason, many companies decide to supplement their insurance coverage with umbrella liability insurance, which will cover claims that go beyond policy limits. This type of insurance protects businesses for claims that exceed the limits of their automobile, general liability, and workers’ compensation insurance policies. 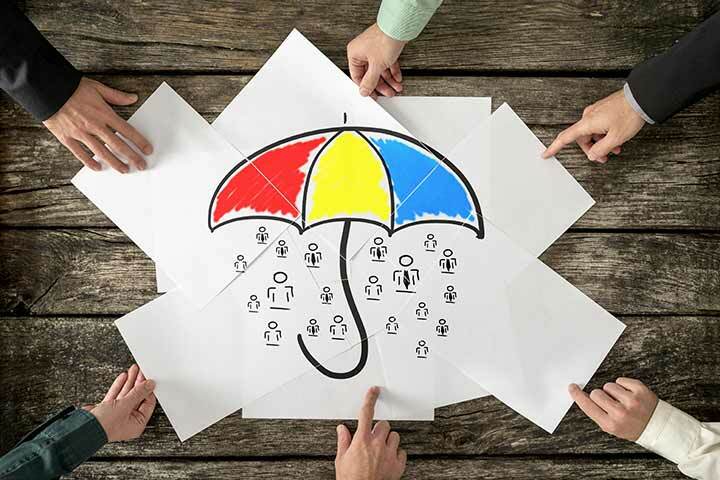 To purchase umbrella liability insurance, the company must already have underlying coverage, as this insurance is intended to act as an “umbrella” of liability protection over the primary policies. Umbrella insurance only kicks in once the underlying insurance has been exhausted. For example, if a business’ general liability policy has a limit of $500,000, the umbrella policy would cover the costs that go above $500,000 — providing an extra layer of protection for the company in the event of a catastrophic loss or major claim against it. While many businesses may assume that their standard policies are sufficient, the limits of these policies may be easily reached if a significant event occurs. For example, if a delivery driver causes an accident that results in the death of a third party, even a high commercial auto insurance policy limit of $1,000,000 could be exceeded in lawyer’s fees and a settlement or an award. In these cases, umbrella insurance would step in to cover the costs that go beyond the initial policy limit. The cost of umbrella insurance depends greatly on the industry involved and the level of coverage required. Businesses involved in trades with a higher potential for large claims such as construction companies will typically pay more for umbrella liability insurance than companies that have a lower risk of a catastrophic claim. An insurance broker can work directly with a business to determine if umbrella liability insurance is right for them. If you own a business, carefully consider the potential claims that may impact your company. Insuring against these claims may be the key to your business’ continued success. Chances are that if a type of claim exists, there is an insurance policy that will cover it. Contact a BBG Broker today to learn more about how you can protect your business against a wide variety of claims.